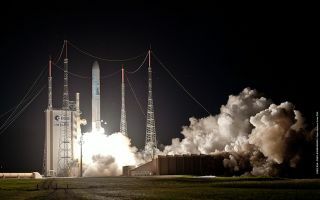 Last night, an Ariane 5 launcher lifted off from Europe’s Spaceport in French Guiana on its mission to place two telecom satellites, Skynet-5D and Mexsat Bicentenario, into their planned transfer orbits. Ariane 5 launcher lifted off from Europe’s Spaceport in French Guiana on its mission to place two telecom satellites, Skynet-5D and Mexsat Bicentenario, into their planned transfer orbits as seen in this space wallpaper. The satellites were accurately released into their geostationary transfer orbits 27 and 36 minutes after liftoff, respectively.